Hasani, A., Kariminik, A., Issazadeh, K. (2014). Streptomycetes: Characteristics and Their Antimicrobial Activities. 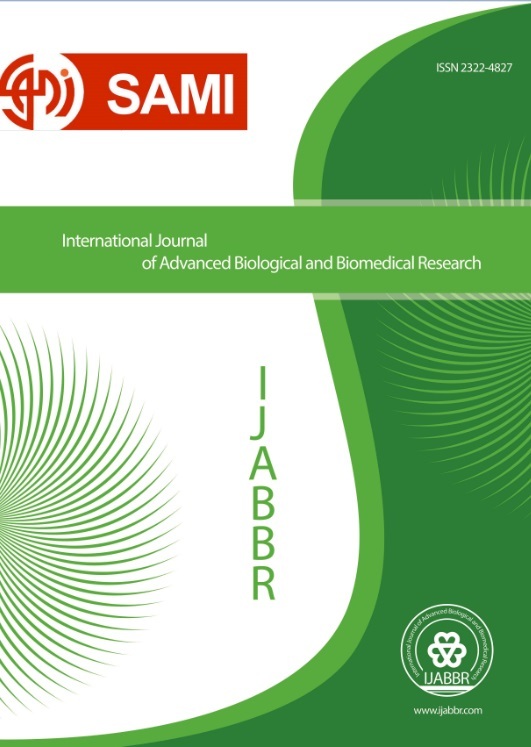 International Journal of Advanced Biological and Biomedical Research, 2(1), 63-75. Amin Hasani; Ashraf Kariminik; Khosrow Issazadeh. "Streptomycetes: Characteristics and Their Antimicrobial Activities". International Journal of Advanced Biological and Biomedical Research, 2, 1, 2014, 63-75. Hasani, A., Kariminik, A., Issazadeh, K. (2014). 'Streptomycetes: Characteristics and Their Antimicrobial Activities', International Journal of Advanced Biological and Biomedical Research, 2(1), pp. 63-75. Hasani, A., Kariminik, A., Issazadeh, K. Streptomycetes: Characteristics and Their Antimicrobial Activities. International Journal of Advanced Biological and Biomedical Research, 2014; 2(1): 63-75. The Streptomycetes are gram positive bacteria with a filamentous form that present in a wide variety of soil including composts, water and plants. The most characteristic of Streptomycetes is the ability to produce secondary metabolites such as antibiotics. They produce over two-thirds of the clinically useful antibiotics of natural origin (e.g., neomycin and chloramphenicol. Another characteristic of Streptomycetes is making of an extensive branching substrate and aerial mycelium.Carbon and nitrogen sources, oxygen, pH, temperature, ions and some precursors can affect production of antibiotics. This review also addresses the different methods to study the antimicrobial activity of Streptomyces sp. Because of increasing microbial resistance to general antibiotics and inability to control infectious disease has given an impetus for continuous search of novel antibioticsall the word. Aghighi , S., Shahidi Bonjar, G., & Saadoun, I. (2004). First report of antifungal properties of a new Strain of Streptomyces plicatus (strain101) against four Iranian phytopathogenic isolates of Verticillium dahliae, a new horizon in biocontrol agents. Biotechnology, 3(1), 90-97. Ambarwati, A., Sembiring, L., & Soegihardjo, C. (2012). Antibiotic produced by streptomycetes associated with rhizosphere of purple nut sedge (Cyperus rotundus L.) in Surakarta, Indonesia. African Journal of Microbiology Research, 6(1), 52-57. Anderson , A. S., & Wellington , E. M. (2001). The taxonomy of streptomyces and related genera. International Journal of Systematic and Evolutionary Microbiology, 51, 797-814. Bais, Y., Nimbekar, T., Wanjari1, B., & Timande, S. (2012). Isolation of antibacterial compound from marine soil actinomycetes. International Journal of Biomedical and Advance Research, 3(3), 193-196. Baniasadi , F. (2009 ). Biological control of Sclerotinia sclerotiorum , by use of soil actinomycetes isolates American J of Agricultural and Biological Sciences, 4(2), 146-151. Baskaran, R., Vijayakumar, R., & Mohan, P. M. (2011). Enrichment method for the isolation of bioactive actinomycetes from mangrove sediments of Andaman Islands, India. Malaysian Journal of Microbiology, 7(1), 26-32. Berdy, J. (2005). Bioactive microbial metabolites: a personal view. J Antibiot, 58(1), 126. Bhattacharyya , B., pal, S., & Sen, S. (1998). Anitibiotic production by Streptomyces hygroscopicus D1.5 , cultural effect. Rev.microbial. , 29(3), 254-257. Bibb, M. (2005). Regulation of secondary metabolism in Streptomycetes. Curr Opin Microbiol 8, 208-215. Boone, R., Castenholtz, R., & Garrity, G. (2001). Bergey's manual of systematic bacteriology'. Springer-Verlag. New York, Berlin Heidelberg,, . 1, 163-164. Busti, E., & Yushi, O. (2006). Media conditions for growthing Actinomycetes Microbial Res, 424-427. Cabello , A., Gonzalez , A., & Genilloud , O. (2003). Patterns of antimicrobial activities from soil Actinomycetes isolated under different conditions of pH. Salinity journal of Applied microbiology, 95(4), 814-823. Chater, K. (1993). Genetics of Differentiation in Streptomyces. Annual Review of Microbiology, 47, 685-711. Cummins , C., & Harris, H. (1958). Studies on the cell-Wall composition and taxonomy of Actinomycetales and related groups. J. gen. Microbiol., 18, 173-189. Deeble, V., Fazeli , M., Cove , J., & Baumberg , S. (2005). Effects of temperature on production of antibiotics in Streptomyces griseus. Journal of antibiotics, 171-178. Dehnad, A., Parsa Yeganeh, L., Bakhshi, R., & Mokhtarzadeh, A. (2010). Investigation antibacterial activity of Streptomycetes isolates from soil samples, West of Iran. African Journal of Microbiology Research, 4(16), 1685-1693. Demain , A. (1980). Microbial production of primary metabolites Naturwissenschaften, 67(12), 582-587. Drew, S., & Demain, A. (1977). Effect of primary metabolites on secondary metabolism. Annual Review of Microbiology, 31, 343-356. Fatope , M., Al-kindi, M., & Abdulnour , O. (2000). Research trends: Natural products as pest, microbial disease and tumor control agents. Sci. Technol, 55-71. Flärdh, K., & Buttner, M. (2009). Streptomyces morphogenetics: dissecting differentiation in a filamentous bacterium. Nature Review, 7, 36-49. Garza-Ramos, U., Silva-Sánchez , J., & Martínez-Romero, E. (2009). Genetics and genomics for the study of bacterial resistance. Galud Pública Mex, 51, 439–446. Gebreyohannes, G., Moges, F., Sahile, S., & Raja, N. (2013). Isolation and characterization of potential antibiotic producing actinomycetes from water and sediments of Lake Tana, Ethiopia. Asian Pac J Trop Biomed., 3(6), 426–435. Gesheva , V., Ivanova , V., & Genava , R. (2005). Effects of nutrients on the production of microbial antibiotic by Streptomyces hygroscopicus. Microbial Res, 160(3), 243-248. Hassan, A., Usman , J., Kaleem, F., Omair, M., Khalid, A., & Iqbal, M. (2011). Evaluation of different detection methods of biofilm formation in the clinical isolates. Braz J Infect Dis., 15, 305–311. Hong, K., Gao, A., Xie, Q., Gao, H., zhuang, L., Yu, H.,Mand Ruan, J. (2009). Actinomycetes for marine drug discovery isolation from Mangrove soils and plants in china microbiological research. Mar Drugs., 7(1), 24-44. Horn, S., Vaaje-Kolstad, G., Westereng, B., & Eijsink, V. (2012). Novel enzymes for the degradation of cellulose. Biotechnology for Biofuels 5(45), 1-12. Ikeda , H., Ishikawa , J., Hanamoto , A., Shinose , M., Ikuchi, H., Shiba, T., . . . Omura , S. (2003). Complete genome sequence and comparative analysis of the industrial microorganism Streptomyces avermitilis. Nature Biotechnology 21, 526- 531. Ilić, S., Konstantinović, S., Veljković, V., Savić , D., & Gojgić-Cvijović, G. (2010). The impact of different carbon and nitrogen sources on antibiotic production by Streptomyces hygroscopicus CH-7. Current research,Technology and Education topics in Applied Microbiology and Microbial Biotechnology, 2, 1337-1342. James, P., & Edwards, C. (1989). The effects of temperature on growth and production of the antibiotic granaticin by thermotolerant streptomycete. J. Gen microbiology 135, 1997-2003. Jonsbu, E., McIntyre, M., & Neilson , J. (2002). The influence of carbon sources and morphology on nystatin production by Streptomyces noursei. J. Biotechnol., 95(2), 133-144. Kalantarzadeh , M. ( 2006 ). Antagonistic potential of two native Streptomyces strains in biocontrol of the major causals of common scab of potato in Iran. Asian J of Plant Sciences, , 5(1), 5-8. Kariminik, A., & Baniasadi, F. (2010). Pageantagonistic activity of Actinomycetes on some gram negative and gram positive bacteria. World Applied Sciences Journal 8(7), 828-832. Kavitha, A., Vijayalakshmi, M., Sudhakar, P., & Narasimha, G. (2010). Screening of Actinomycete strains for the production ofantifungal metabolite. African Journal of Microbiology Research, 4(1), 27-32. Kharat, K., Kharat, A., & Hardikar, B. (2009). Antimicrobial and cytotoxic activity of Streptomyces sp. from Lonar Lake. African Journal of Biotechnology, 8(23), 6645-6648. Kieser , T., Bibb, M., Buttner, M., Chater, K., & Hopwood, D. (2000). General Introduction to Actinomycete Biology. In: Practical streptomyces Genetics. The John Innes Foundation, Crowes, Norwich, England,. 1-21. Kim, S., Seong, C., Jeon, S., Bae, K., & Goodfellow, M. (2004). Taxonomic study of neutrotolerant acidophilic actinomycetes isolated from soil and description of Streptomyces yeochonensis sp. nov. . International Journal of Systematic and Evolutionary Microbiology, 54(1), 211-212`214. Korn-Wendisch , F., & Kutzner, H. (1992). The family Streptomycetaceae In: 'The prokaryotes (2 ed Edn),(Eds A Balows, HG Truper, M Dworkin, W Harder and KH Schleifer), Springer-Verlag: New York,. 2, 923-995. Kumar, P., Preetam Raj, J., Duraipandiyan, V., & Ignacimuthu, S. (2012). Antibacterial activity of some actinomycetes from Tamil Nadu, India. Asian Pac J Trop Biomed 2(12), 936-943. Kuster, E., & Williams, S. (1964). Selection of media for isolation of Streptomycetes. Nature, 202(4935), 928-929. Lee , J., Jung, H., & Hwang, B. (2005). Streptomyces koyangensis sp. nov., a novel actinomycete that produces 4-phenyl-3-butenoic acid Int J Syst Evol Microbiol, 55, 257-262. Lee, M., & Demain , A. (1997). Effects of nitrogen source on production of antibiotics Journal of Microbiology, 412-422. Locci, R. (1989). Streptomyces and related genera. Bergeys manual of systematic bacteriology. Baltimore: Williams & Wilkns Company. 2344-2508. Lounes, A., Lebrihi, A., Benslimane, C., Lefebvre , G., & Germain, P. (1996). Regulation of spiramycin synthesis in Streptomyces ambofaciens: effects of glucose and inorganic phosphate. Appl. Microbiol. Biotechnol, 45(1-2), 204-211. Maleki, H., Dehnad, A., Hanifian, S., & Khani, S. (2013). Isolation and molecular identification of Streptomyces spp. with antibacterial activity from northwest of Iran. BioImpacts, 3(3), 129-134. Manivasagan, P., Gnanam, S., Sivakumar, K., Thangaradjou, T., Vijayalakshmi, S., & Balasubramanian, T. (2009). Antimicrobial and cytotoxic activities of an actinobacteria (Streptomyces Sp. PM-32) isolated from an offshore sediments of the Bay of Bengal in Tamilnadu. Advances in Biological Research 3(5-6), 231-236. Mann, J. (2001). Natural products as immunosuppressive agents. NatProd Rep, 18, 417-430. Martin, J. F. (2004). Phosphate control of the biosynthesis antibiotics and other secondary metabolites is mediated by the PhoR-PhoP system: an unfinished story. J. Bacteriol., 186(16), 5197-5201. Mc Gregor , J. (1954). Nuclear division and the life cycle in a Streptomyces sp. J. gen .Microbiol 11, 52-56. MCIntyre, J. (2002 ). Antibiotic drugs. Journal of Antibiotics 34, 356-370. Mohanraj, G., & Sekar, T. (2013). Isolation and screening of actinomycetes from marine sediments for their potential to produce antimicrobials Int. J. LifeSc. Bt & Pharm. Res, 2(3), 115-126. Mokrane, S., Bouras, N., Sabaou, N., & Mathieu, F. (2013). Actinomycetes from saline and non-saline soils of Saharan palm groves: Taxonomy, ecology and antagonistic properties. African Journal of Microbiology Research, 7(20), 2167-2178. Mukhtar, H., Ijaz , S., & Ul-Haq, I. (2012). Production of antitumor antibiotic by Streptomyces capoamus Pak. J. Bot.,, 44(1), 445-452. Nikaido, H. (2009). Multidrug Resistance in bacteria. Annu Rev Biochem, 78, 119–146. Nonoh, J., Lwande, W., Masiga, D., Herrmann, R., Presnail, J., Schepers, E., . . . Boga, H. (2010). Isolation and characterization of Streptomyces species with antifungal activity from selected national parks in Kenya. African Journal of Microbiology Research, 4(9), 856-864. Orna, M. (2001). Women chemists in the national inventors hall of fame:Their remarkable lives and their awaer-winning research Bull. Hist. Chem., 34(1), 50-60. Pallavi , S., Manasa, M., Kambar, Y., Asha, M., Chaithra, M., Vivek, M., . . . Mallikarjun, N. (2013). Anti-Staphylococcus aureus and Anti-yeast activity of Streptomyces species isolated from rhizosphere soil of Sahyadri Science College, Shivamogga, Karnataka. Asian Journal of Biomedical and Pharmaceutical Sciences, 3(24), 7-11. Procópioa, R., Silvaa, I., Martinsa, M., Azevedoa, J., & Araújob, J. (2012). Antibiotics produced by Streptomyces. The Brazilian Journal of infectious diseases, 16(5), 466-471. Quintana, E., Wierzbicka, K., Pawel Mackiewicz , Osman , A., Fahal, A., Hamid, M., . . . Goodfellow, M. (2008). Streptomyces sudanensis sp. nov., a new pathogen isolated from patients with actinomycetoma. Antonie van Leeuwenhoek, 93, 305–313. Rafieenia, R. (2013). Effect of nutrients and culture conditions on antibiotic synthesis in Streptomycetes. Asian Journal of Pharmaceutical and Health Sciences, 3(3), 810-821. Rahmansyah, M., Agustiyani, D., Julistiono, H., & Dewi, T. (2012). Groeth and adaptation of four Streptomyces isolates in the media containing propoxur ARPN Journal of Agricultural and Biological Science, 7(9), 773-781. Remya, M., & Vijayakumar, R. (2008). Isolation characterization of marine antagonistic actinomycetes from west coxst of india. Medicine and Biology, 15, 13-19. Rowbotham , T. J., & Cross, T. (1977). Ecology of Rhodococcus coprophilus and associated Actinomycetes in fresh water and agricultural habitats. Journal of General Microbiology, 100(2), 231-240. Rugthaworn , P. (2007). A search and improvement of actinomycete strains for biologhcal control of plant pathogens Kasetsart J, 41, 248-254. Saadoun , I., Momani, A., Malkawi, H., & Mohammad, M. (1999). Isolation, identification and analysis of antibacterial activity of soil streptomycetes isolates from north Jordan. Microbios, 100, 41-46. Sahin, N., & Ugur, A. (2003). Investigation of the antimicrobial activity of some Streptomyces isolates. Turk J Biol, 27, 79-84. Sanglier, J., Haag , H., Huck , T., & Fehr, T. (1993). Novel bioactive compounds from actinomycetes. Res Microbiol. , 144(8), 661-663. Schats, A., Bugie , E., & Waksman, S. (1994). Streptomycin, a substance exhibiting antibiotic activity against gram-positive and gram-negative bacteria. Proceeding of Society for Exprimental Biology and Medicine,, 55, 66-69. Sejiny, M. (1991). Growth phrases of some antibiotics producing Streptomyces and their identification. J.K.A.U.Sci, 3, 21-29. Selvakumar, D., Arun, K., Suguna , S., Kumar, D., & Dhevendaran , K. (2010). Bioactive potential of Streptomyces against fish and shellfish pathogens. IRAN. J. MICROBIOL., 2(3), 157-164. Seong, C., Choi, J., & Baik, K. (2001). An improved selective isolation of rare Actinomycetes from forest soil. The Journal of Microbiology, 39(1), 17-23. Shahidi Bonjar, G. (2004). Screening for antibacterial properties of some Iranian plants against two strains of Escherichia coli. Asian Journal of Plant Sciences, 3, 310-314. Shomurat, T., Yoshida, J., Amano, S., Kojina, M., & Niida, T. (1979). Studies on actinomycetal producing antibiotics only in agar culture. I. Screening taxonomy and morphology – productivity relationship of Streptomyces halstedii, strain SF. J Antibiot, 32, 427-435. Silva, M., & Anne, D. (2004). The best penicillin for resistant bacteria Journal of antibiotics, 48, 562-569. Singh, L., Baruah, I., & Bora , T. (2006). Actinomycetes of Loktak habitat: isolation and screening for antimicrobial activities. Biotechnology 5(2), 217-221. Smaoui, S., Mathieu, F., Fguira, L., Merlina, G., & Mellouli, L. (2011). Taxonomy and antimicrobial activities of a new Streptomyces sp. TN17 isolated in the soil from an Oasis in Tunis. Arch. Biol. Sci., Belgrade, 63(4), 1047-1056. Srivibool, R., Kurakami, K., Sukchotiratanac, M., & Tokuyamab, S. (2004). Coastal soil actinomycetes: Thermotolerant strains producing N-Acylamino acid racemase. Science Asia 30, 123-126. Subbarao , N. (1999). Soil Microbiology (4th edition ). Science Publishers, Inc: USA. 279-283. Sujatha, P., RajuB, & Ramana, T. (2005). Actinomycetes of Loktak habitat: isolation and screening for antimicrobial activities. Mirobiological Research, 160, 119-126. Vetsigian, K., & Roy Kishony, R. (2011). Structure and evolution of Streptomyces interaction networks in soil and in silico. PLoS Biology, 9(10), e1001184. Wang, Y., Zhang, Z. S., Ruan, J., Wang, Y. M., & Ali, S. (1999). Investigation of actinomycete diversity in the tropical rainforests of Singapore. J. Ind. Microbiol. Biotechnol., 23, 178-187. Watve, M., Tichoo, R., MM, J., & Bhole, B. (2001). How many antibiotics are produced by the genus streptomyces? Arch Microbiol, 176, 386-390. Willemse, J., Borst, J., Waal, E., Bisseling, T., & Wezel, G. (2011). Positive control of cell division: FtsZ is recruited by SsgB during sporulation of Streptomyces Genes & Dev., 25, 89-99. Williams , S., Goodfellow, M., Alderson, G., Wellington, E., Sneath , P., & Sackin, M. (1983). Numerical classification of Streptomyces and related genera. Journal of General Microbiology,, 129, 1743-1813. Wright , G. (2010). Antibiotic resistance in the environment: a link to the clinic? Curr Opin Microbiol, 13, 589–594. Ying , Y., & Marta, M. (2001). Effects of L-lysine on production of rapamycine. Journal of Drugs, 102-105. Young, M., & Kempe, L. (1985). Effects of phosphate, glucose, and mmonium on cell Growth and lincomycin production by Streptomyces irncohensis in chemically defined media. Biotechnology and Bioengineering, 55(2), 327-333.